Cabin length 8'-0" 12'-0" 16'-0"
Cabin width 8'-0" 8'-0" 8'-0"
Roof length 12'-0" 16'-0" 20'-0"
Floor area 64 sq.ft. 96 sq.ft. 128 sq.ft. 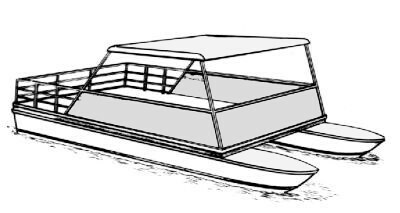 Height above deck 6'-6" 6'-6" 6'-6"
Construction: Lightweight plywood panel interior with 2" stud wall construction and cambered roof over three full length roof beams. Exterior covered with light gauge aluminum sheeting.